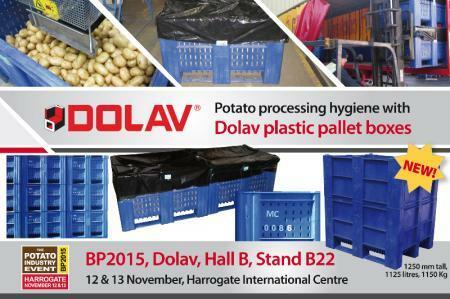 Potato processing hygiene is greatly helped with cleanable Dolav plastic pallet boxes. McCain chose the perforated 740mm tall Dolav Ace to allow air flow around the potatoes when in cold store and now also uses the solid-wall Ace. McCain’s Dolav boxes are easily kept clean to food-hygiene standards and reused in a continuous cycle from potato washing and grading plants to factory. The Dolav Ace has been confirmed by technicians at the food and drink industry scientific, technical and advisory services, Campden BRI, as having ‘hygienic design’. The Dolav Ace plastic pallet box is designed and injection moulded in one single piece, with three integral runners, to be strong and hygienic as this eliminates cavities. The Dolav is also hygienic due to the smooth, clean lines with rounded internal corners. That is essential for easy, effective and routine cleaning of equipment in direct contact with potatoes, meat, fish, fruit and vegetables and during food production. The Dolav Ace has been abuse tested by TÜV SÜD and performed best vs. competitor boxes in the same tests. End-of-life Dolavs can be ground up and their HDPE recycled into making wheelie bins. With Dolavs, EoL can be after 20-30 years or more. Their recycled HDPE then starts anew as wheelie bin containers to help recycle household waste for many more decades.